The CLOUD team will be able to recreate the conditions of any part of the atmosphere inside the new chamber, from the polar stratosphere to the low level tropics. The new chamber arrives in the East Hall. 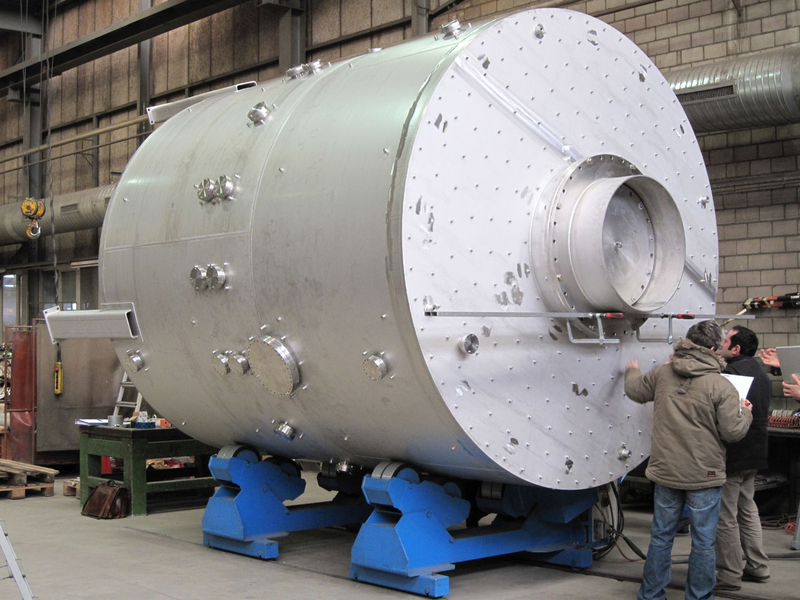 Once carefully cleaned the chamber will be turned sideways onto its legs ready for the beam of ‘cosmic rays’. The link between cosmic rays and climate change is one that has been hotly debated over the past decade, grabbing the attention of the media. The idea revolves around the possibility that particles entering the atmosphere from space can affect cloud formation, which in turn affects the climate. But despite the controversy surrounding the theory, the central question – ‘do cosmic rays help create clouds?’ – has barely been tested in a laboratory before. The CLOUD (Cosmics Leaving OUtdoor Droplets) experiment here at CERN will be one of the first experiments in the world directly to test the effect of cosmic rays on cloud formation under controllable laboratory conditions. 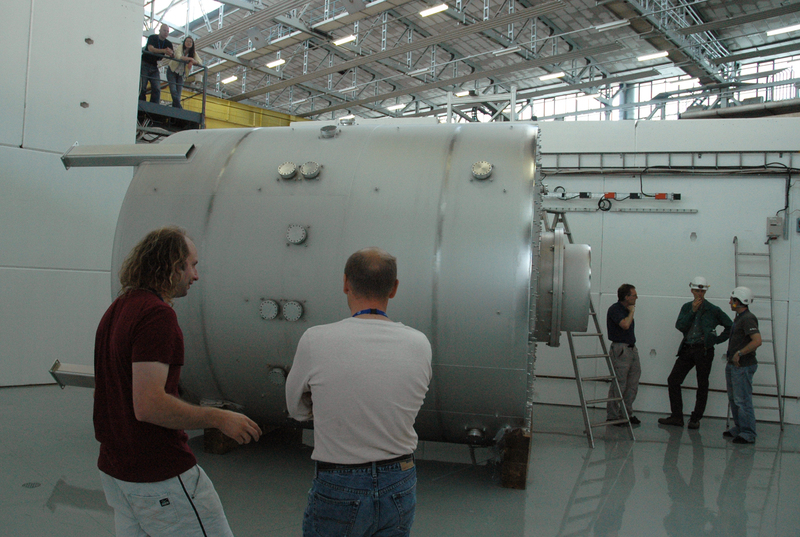 The experiment’s three-metre diameter aerosol/cloud chamber arrived on Wednesday 20 May. This crucial piece of the experiment will be used to recreate carefully various conditions in the atmosphere. The chamber is the culmination of three years’ research and design since the experiment was first approved in 2006. After being fitted with an array of sensitive analysing instruments, it will be carefully cleaned, tested and calibrated. The team hope to start collecting data later this year. "I think the evidence for a link between reconstructions of past climate change and solar activity is too strong to ignore," explains Jasper Kirkby, Spokesperson for the CLOUD experiment. "There are a lot of observations showing that variations of the sun seem to be affecting the climate, but we don’t yet know what the mechanism for this is." "The aim of CLOUD is to understand whether or not cosmic rays can affect clouds and climate, by studying the microphysical interactions of cosmic rays with aerosols, cloud droplets and ice particles." This is one of the possible mechanisms for solar-climate variability since the solar wind – the stream of charged particles ejected from the sun – varies over time and affects the intensity of the cosmic rays that reach the Earth. "The whole process is well understood except for whether or not cosmic rays do indeed affect clouds. If that process can be established then I think solar-climate variability will very rapidly change from being a controversial subject to one with a lot of respectability. If, on the other hand, we rule out the process then this will allow us to focus on other mechanisms that might be causing the link," continues Kirkby. A beam from the Proton Synchrotron is used to create a beam of ‘artificial cosmic rays’. These can be carefully controlled and aimed into the new chamber, which is bristling with sensors like spectrometers, ice-crystal detectors and CCD cameras. With the addition of a thermal housing and control system next year the team will be able to recreate the conditions of any part of the atmosphere inside the chamber, from the polar stratosphere to the low level tropics. "We can carefully control what is inside the chamber, but we can also control the cosmic rays," say Kirkby. Being able to test under controllable conditions is what makes CLOUD different from atmospheric observations. "If you measure something directly in the atmosphere then you can never be certain what caused it as there are so many changing variables to take into account." Cloud formation strongly depends on certain trace gases in the atmosphere, and their concentrations inside the chamber need to be controlled precisely. So one of the big challenges is to make the chamber as clean as possible, which has involved CERN experts who are used to dealing with ultrahigh vacuum components for the accelerators. "But even by CERN standards, the CLOUD requirements are challenging. We control the concentrations of certain gases to better than one part per trillion, which is 4-6 orders of magnitude below what is necessary for most particle physics liquid or gaseous detectors". This is the first time a particle accelerator has been used to study atmospheric and climate science and CLOUD therefore lies at an intersection between several different disciplines. The team includes atmospheric physicists and chemists, solar physicists, cosmic-ray physicists and particle physicists. "CLOUD has a world-class experimental team, bringing together the leading aerosol and cloud physicists in Europe and America", says Kirkby. "Working on an interdisciplinary experiment is certainly exciting. Particle physics and atmospheric physics tend to approach things differently - there is almost a cultural difference. Particle physicists are always happier to look at the simplest, most fundamental systems, whereas most atmospheric and climate physicists approach from one of the most complex systems possible – namely the atmosphere and climate." In fact, the team come from such a variety of disciplines that the Universities of Geneva and Lausanne have initiated a sociological PhD project on CLOUD to observe how interdisciplinary collaborations work.